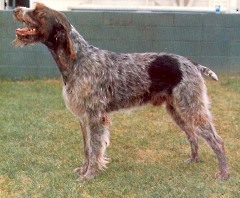 Other than my bristly, wire-haired coat, I am similar in body structure and talents to my cousin, the German Short-haired Pointer. There is a difference in our personalities, though. I am just as intelligent as my cousin and I respond well to training, but I am aggressive at times, so I make a much better hunting companion than a family pet, especially if there are small children in the household. When fully grown, I am between 24 and 26 inches tall (61 to 66 centimeters) and I weigh between 60 and 70 pounds (27 to 31.5 kilograms). We have no German Wirehaired Pointer Breeders listed at this time. Click here to place your German Wirehaired Pointer Ad!